My sincere apologies for not posting my new watercolor sketch that is well underway. 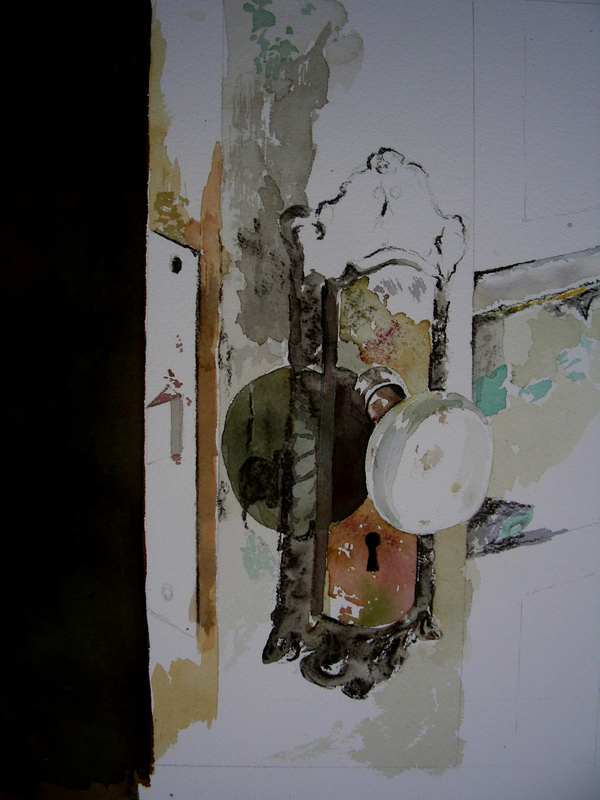 I did in fact begin a second “doorknob drybrush” after school this afternoon, and to my dismay, ran out of Winsor & Newton Transparent Yellow and Winsor Violet pigments. All I had managed to do in 45 minutes was a careful drawing of the new 8 x 10″ composition and some basic washes in pale yellow and violet. Leaving the studio, I dashed to Asel Art in the Fort Worth Museum District, and was about to return home at dark, when I suddenly realized–Halloween. Drat. I live in a neighborhood, which means my night would be filled with running back-and-forth from the garage studio through the kitchen, dining and living rooms, to the front door to answer doorbells. I had not yet gone to the store to buy stockpiles of candy, and so I decided (yes, Grinch that I am) to go to the University Park Barnes & Noble Store and Starbuck’s Cafe and thus spend the night perusing four of the Andrew Wyeth books I had packed this morning in my school bag, along with my journal and laptop. So, here I am. I really wish I could have painted this evening, but based on past Halloweens, that would not have happened until much later. The Andrew Wyeth studies have flooded my soul with fresh inspiration. I simply cannot get enough of his drybrush, pencil and watercolor renderings of still life objects up-close-and-personal. And I’m still filled with enthusiasm over the one I finished yesterday. My new piece is of a different door and doorknob/locking assembly arrangement. I am fascinated with the chipped paint surrounding the lock box. Again, I will try to make the background extremely dark, combining mostly Winsor Violet and Transparent Yellow. I also picked up at the store some more graphite pencils and plan to work more of them into the details of the composition as well (something I had intended with yesterady’s painting, but forgot). One of my favorite portions of the Andrew Wyeth interviews read tonight (from the Autobiography, foreward by Thomas Hoving) was his description of the process of drybrush, where one weaves the brush of dried pigment into the layers of wash and employs graphite pencils for detail work. Wyeth also used Higgins’ ink, which I have not chosen to use (though I tried this many, many years ago in my watercolors). When I return home later tonight, I plan to layer the dark washes of violet and yellow into the background, giving it a good soaking, then let it set up overnight. Perhaps tomorrow I can return to the work after school and try to finish it (though I have another weekend art festival for which I have not yet begun to pack and load). Oh well . . . Thanks for reading. I’ll post pictures of the new work tomorrow. What a whirlwind of an afternoon and evening! If you read my earlier post, you know that I got caught up in a drybrush rendering of an antique door knob and assembly. That made for a pleasant afternoon of meditation. 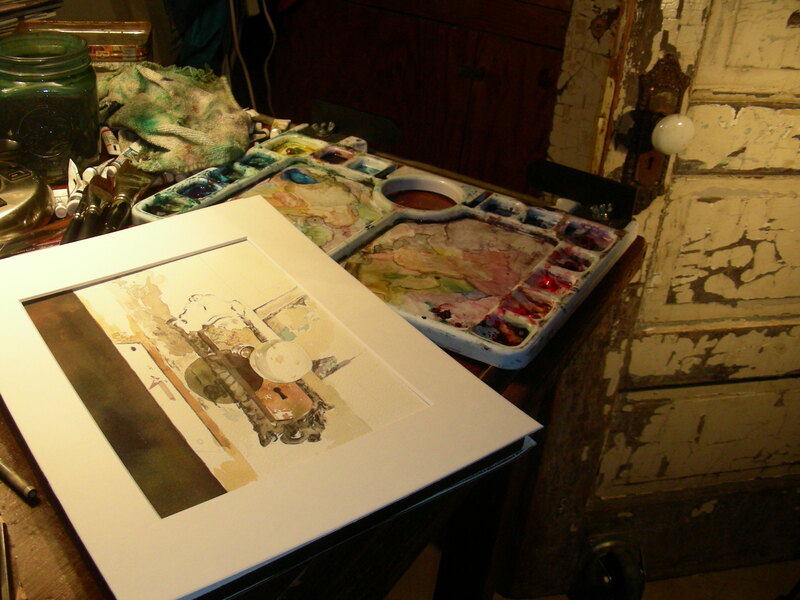 Following supper and school preparations, I was surprised to find it only 9:30 p.m., so I decided to take my cattle drive watercolor out into the man cave and work on that left-hand foreground horse some more. After an hour, I decided to call it a night. 6:00 a.m. comes rather quickly. I have decided to post a few more pictures of this afternoon’s session (photos I meant to post then, but forgot). Thanks for reading. I cannot wait for tomorrow afternoon to arrive. I’m ready to push these paintings a little farther down the road. Midway through my art history class today, while studying the Roman Colosseum, I suddenly knew what I was going to attempt this afternoon. There were so many tasks to get out of the way first, but finally, at 4:30, I entered the man cave, and two hours later, this drybrush watercolor sketch lay before me. I could never faithfully record what flooded my soul during those two hours, but let me try . 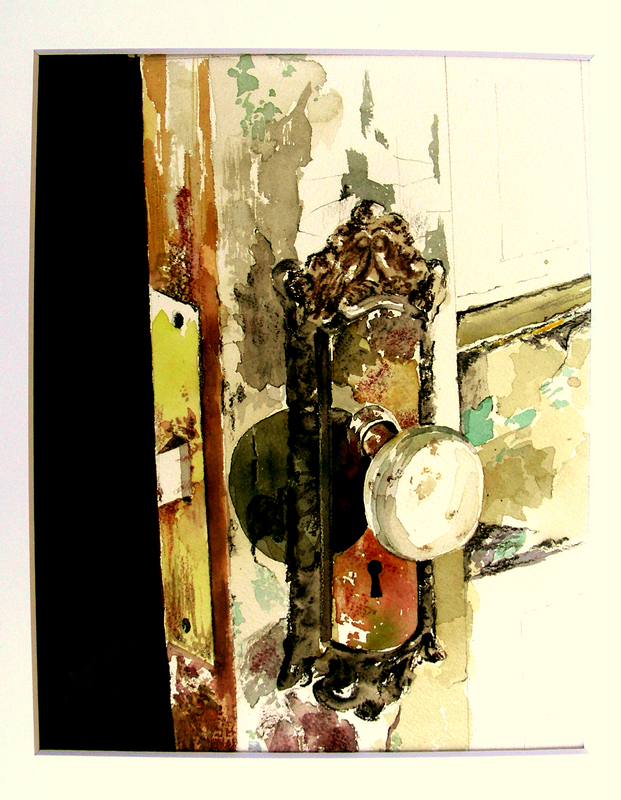 . .
For years, I have sat for long hours in my booth during art festivals, alone, with little more to do than stare at the antique doors used for displaying my framed watercolors. This particular door came with a nice vintage doorknob, engraved plate and locking system. I have had it for over ten years and cannot begin to calculate the hours I have spent staring at it. It used to sit in the back of my classroom. 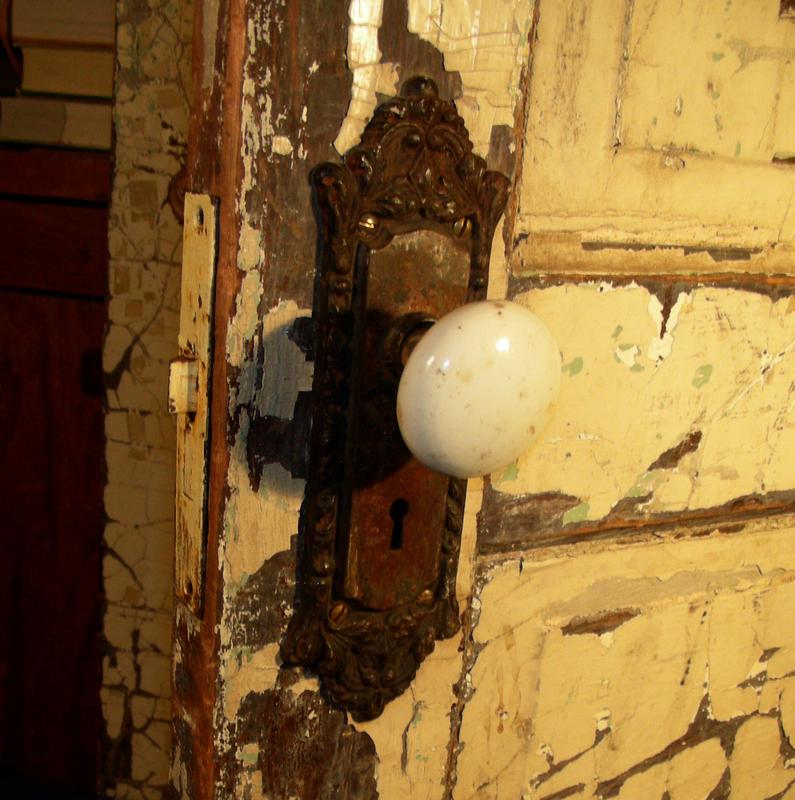 My grandfather Tripp had such a door to the little house in which he spent his evenings after supper, and as a child, I was fascinated with the door knob and the engraved plate, as well as the chipped finish of several layers of paint on his door. After a weekend spent viewing Andrew Wyeth drybrush works, and a couple of days poring over color plates in the books I own of his collections, a recurring idea came to me from William Carlos Williams, Ezra Pound and the Imagist movement in writing–no ideas but in things. Earlier this year, I made some Pop Art attempts at recreating tins advertising Lucky Strike and Maxwell House. The paintings have a prosaic quality about them, much like Andy Warhol’s Campbell Soup cans and Coca-Cola bottles. But now, I wished to execute an exacting, detailed drybrush rendering of this old doorknob that looks like the one I saw as a small child at my Grandfather’s. So, with the western sun waning this afternoon and flooding the garage with yellow light, I sought a way to channel that warmth into the back of my man cave (I probably looked quite the fool, pulling antique doors in front of my garage door windows to block out excess light, and stacking crates on top of trunks to block out further excess light–it seemed to take forever to get the lights and shadows to work properly on just this one doorknob! But somehow, I felt that the effort would pay off. And it did. I may awaken in the morning, take a fresh look at this sketch, and decide it is garbage. But even if that is so, I am convinced now that I am on a path that is worth following further. I want to develop a skill to record these objects in a way that brings back the warm Proustian sentiments I have known throughout the decades of my life–the thrill and shock of recognition when I see a prosaic object that is charged with primal memories that matter to me, memories from my childhood that still linger and flood my being with a sense of good will. To say it again–no ideas but in things. Thank you Andrew, William, Ezra and Willis (my grandfather). You have given me something worth pursuing. 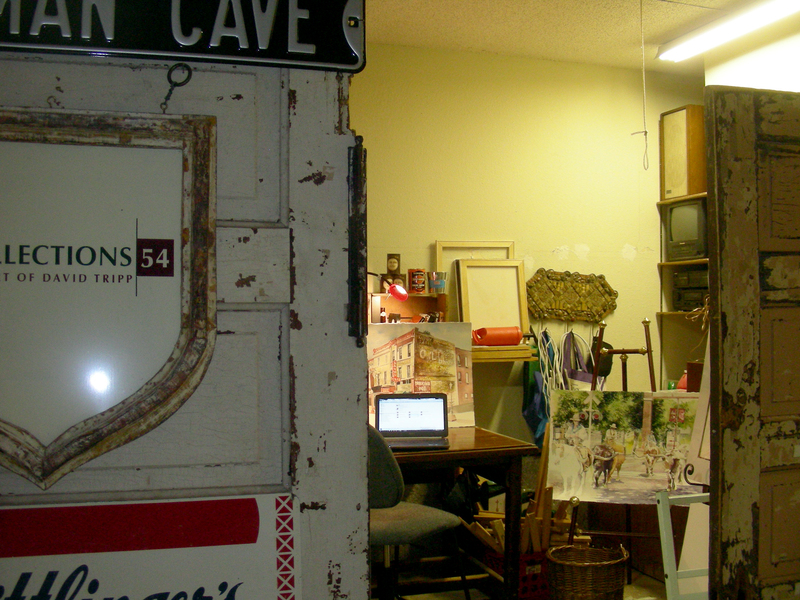 Finally, after months of formidable Texas heat, I am permitted to return to my abandoned Man Cave! The space in the garage had become so run down during the hot months, that it took a good part of Saturday evening and Sunday to render it habitable. I moved in this evening and christened the space by grading senior English tests (ugh!). Now that those have been laid aside, I have returned to some subjects that I left behind with my Philosophy class last Thursday, namely Descartes’ discovery while in the stove, and the notion of great thinkers withdrawing in solitude when they had matters to sort out (we discussed Jesus, Emerson, Thoreau, Hume, Nietzsche and a host of others). This evening I thought I would spend a little more time with Montaigne and Benjamin Franklin before calling it a weekend and working on a decent night’s sleep. I’m grateful beyond words for the museum, the painting time, some major house cleaning, and above all, reclaiming my Man Cave for the coming winter. This weekend has been sublime, and I look forward to the next one. In the past few days, I have reopened Jack Kerouac’s On the Road, thus renewing my own favorite past time. As I journeyed two hours toward Tyler, Texas early yesterday morning, I laughed to myself as I recalled the words above that Ken Kesey uttered in a moment of candor. Many times I have found nothing more than extra knolls waiting for me as I journeyed hopefully toward some kind of grail at the end of my road odyssey. But yesterday, something wonderful indeed was waiting at the end of my search. I was greeted by the embrace of Wyeth’s spirit, and delighted myself in the company of his marvelous art. Today has been an all-day romp over this painting (except for some stolen moments re-assembling my man cave in the garage–it’s nice to have cold weather in Texas and be able to work in the garage, putting that abandoned studio back in order). 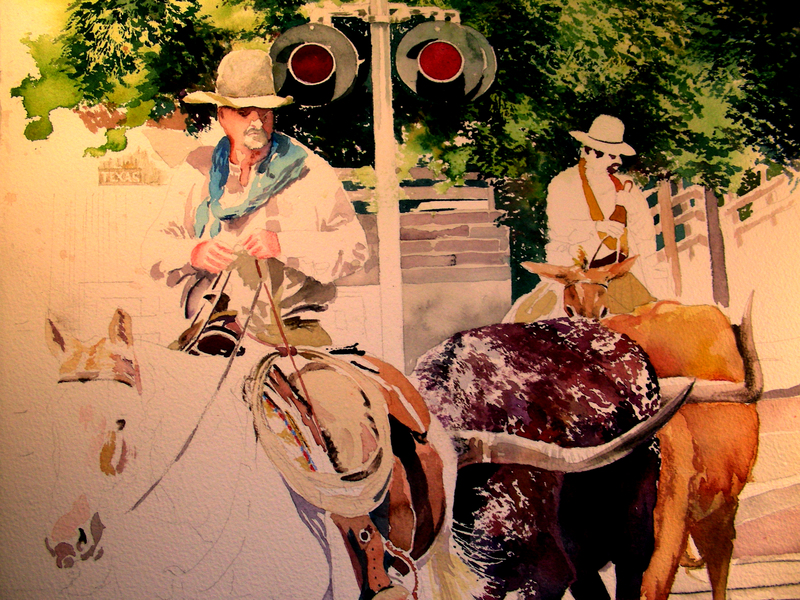 As I linger over the surface of this cattle drive, I continue to stitch up loose details. I spent most of today on the right-hand side of the composition, detailing and separating the bodies of the longhorns and trying to finish the background foliage, signage and grounds. 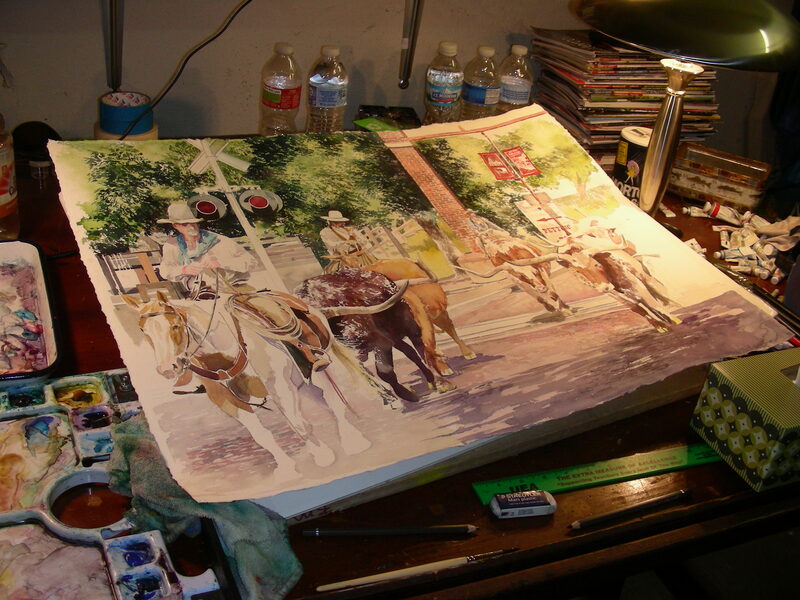 Then I switched to the left, laying in the basic colors and textures of the street beneath the foreground horse’s hooves. I still have plenty of work to do on the horse and rider. As I retired to bed last evening, thinking over the events of the Andrew Wyeth day I had just experienced, I could not stop writing in my journal and perusing the volumes I have on Wyeth’s work. Plenty of ideas for new work emerged, and I am anxious to see where they take me. I have not only Wyeth to thank for the new ideas, but some key ideas that have sprung from recent readings in T. S. Eliot, Henry David Thoreau and especially Joseph Heller’s Something Happened. I found the reading of Heller’s novel very sobering when I first went through it back in 2005. When we get past mid-life, things happen that often turn our world dark, and Something Happened explores that world with frankness. Well, yesterday I can certainly say Something Happened, and it is much larger than Wyeth and an art museum, and I cannot express enough gratitude for it. For the first time in years, I feel that I could be on to something quite special as I make this new excursion into art production. Indeed, I have heightened expectations for new discoveries. “A great truth is like a mountain that one walks around, and the changes of its contour as one moves his position only emphasize and revivify its majesty.” (N. C. Wyeth’s last letter to Andrew, dated February 16, 1944). I hardly know how to describe this Texas Saturday. Rising at 7:00 a.m. to a 38-degree morning, I wasted no time in getting dressed and loading the Jeep to travel two hours east to Tyler Texas. I learned two days ago that the Tyler Museum of Art was exhibiting “The Wyeths Across Texas,” a collection of N. C., Andrew and Jamie’s work from Texas private collections. The two-hour drive may as well have been two days, as I could not seem to get there quickly enough. I spent three hours in the midst of the exhibition that occupies three small galleries. But I only knew that because I checked the time as I exited the building. I was lost in the heart of eternity as I breathed in those magnificent pieces. I also viewed a 60-minute documentary, Andrew Wyeth Self-Portrait: Snow Hill. I could not help purchasing the DVD as it was impossible to glean all the wealth available in the presentation. I am still vibrating from what I’ve taken in so far. So, with that quote murmuring in my heart, I put on a CD of Bach’s Concerto No. 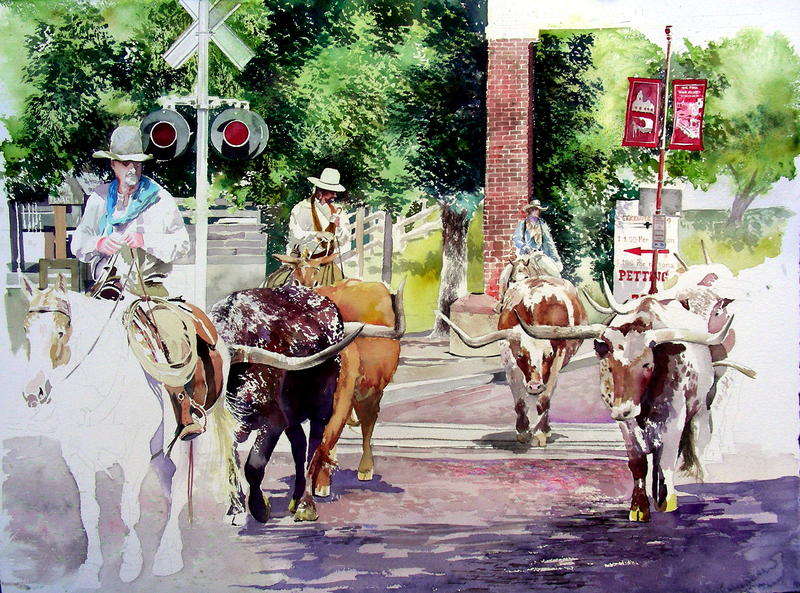 1 in D Minor, and resumed my Fort Worth cattle drive, reminding myself that the close, detailed study of one longhorn was no more or no less significant than the undulating background foliage or the foreground inlaid bricks in the street, or the fleeting shadows beneath the longhorns–just one more effortless, timeless series of threads embedded in this tapestry woven for several weeks now. I no longer fret over the time spent, or the prospects stretching endlessly before me. I just paint in the embrace of Bach’s music, and the grateful memories of a day spent in communion with Wyeth’s art work. 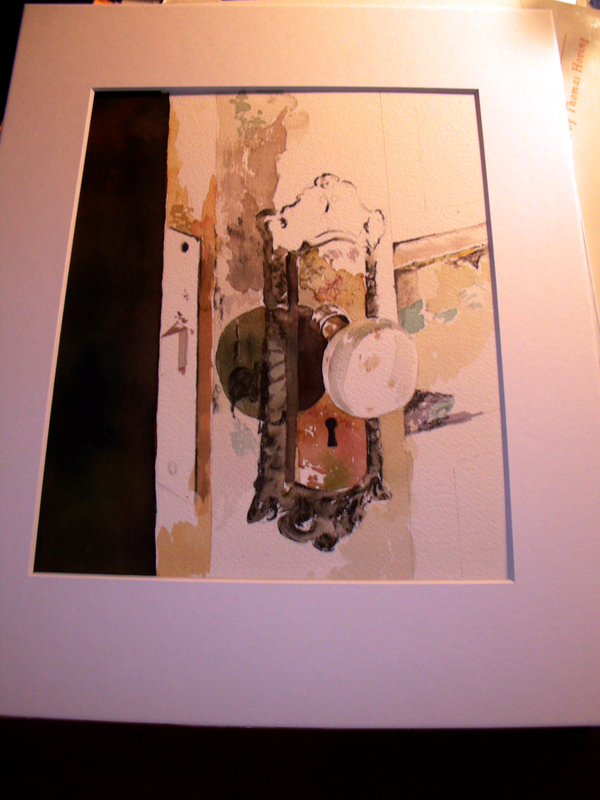 This is my last evening to work on this watercolor. I leave immediately after school Friday for Edom Festival of the Arts. I regret that I will be unable to post to my blog while there. No Internet service will be available in that remote area. In fact, there will be no electricity on the festival grounds. I know that from past experience, this being my third year to participate. The festival is absolutely wonderful, with patrons driving long distances to reach that remote East-Texas setting. The beautiful pastureland and shade trees make the festival idyllic, and I can hardly wait to get there. Once my tent is up, I plan to relax under the trees and perhaps get in some quality plein air watercolor sketching done of the surrounding terrain (I enjoyed doing that last year). 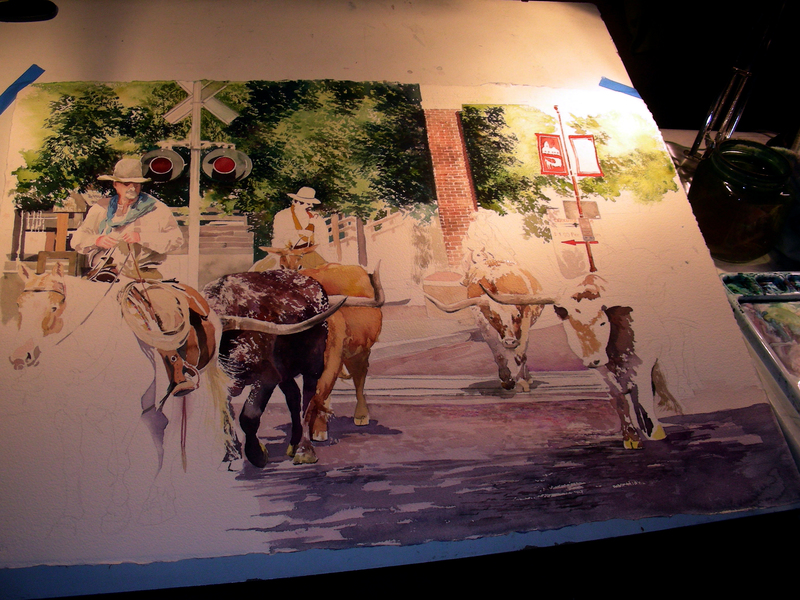 I am getting attached to this stockyards painting. The color and textures on the hides of the longhorns are proving to be a real challenge, and are pushing me into some color schemes I haven’t explored previously. The banners hanging from the lamp post also hold a fascination for me, as do the signs in the right background. 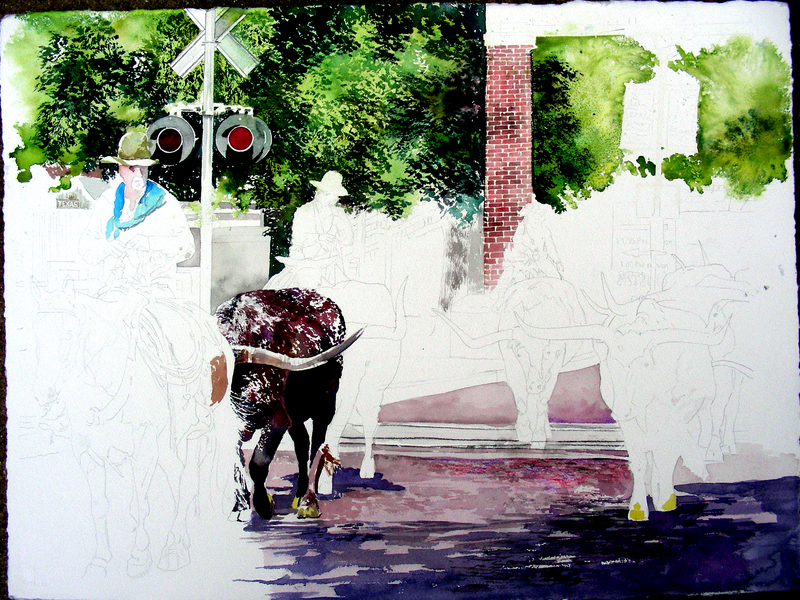 I am still exploring the contrasting values of the longhorns and the street surface below, and haven’t quite decided where to push that. Much work remains on the horse to the left, and the horses and riders in the rear center are not even yet underway. Plenty of work remains. At this point, it appears that I will not be able to touch this till Monday. To say the very least, the consecutive weekend art festivals (three in a row) combined with a full-time high school teaching load is taking a toll on me. But there is light at the end of the tunnel–this weekend’s Edom Festival of the Arts will mark the end of my art festival season for 2012. After such a bruising 2012 schedule, I have the winter to decide between quitting the art festival circuit completely, or restricting my shows to 2-3 a year (instead of the dozen or more that have marked my last few years). 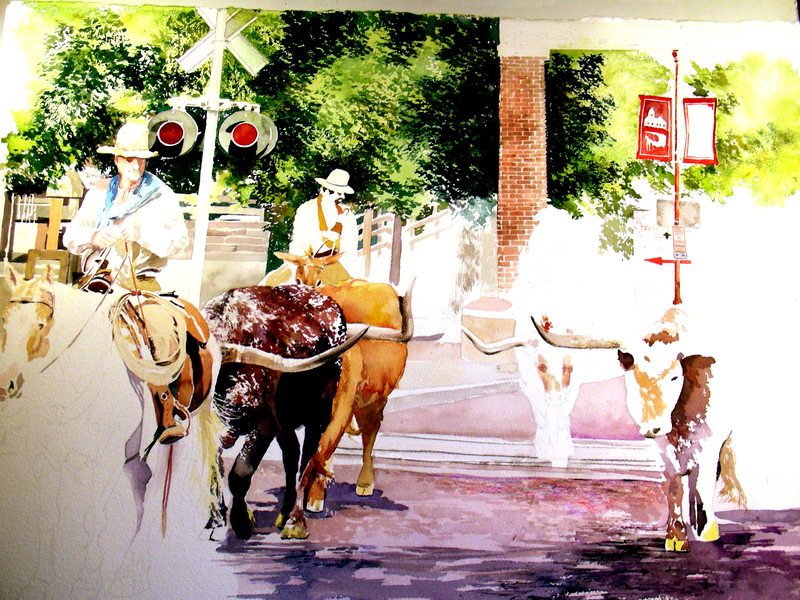 I found some daylight in my afternoon schedule today to pursue this full-size Stockyards cattle drive watercolor I started a few weeks back. I hate that the festivals have taken me out of the studio of late. This afternoon and evening have been soothing as I have watched the details of this watercolor slowly emerge. Most of my attention has been focused on the horse at the left foreground, particularly the saddle, rope and harnessing, along with the clothing of the rider. I have opened the windows of my studio, and the cool winds coming through the night are a stark contrast with the triple-digit heat I knew the day I took this series of cattle drive photographs. It was Thursday afternoon, August 9, 2012, at 2:46 p.m., with temperatures soaring over 100 degrees. I sat on a bench beneath a tree on Fort Worth’s West Exchange Avenue and waited for the 4:00 cattle drive that would be coming down the street. I wrote in my journal, read from a good book, made some preliminary sketches of the environment, and waited. Finally, they rounded the corner and tramped straight in my direction as I snapped dozens of photos of this longhorn cattle drive that is a Fort Worth cultural tradition held twice daily. My reason for waiting several months before attempting this is my reservation to paint longhorns for the first time. I felt the same paralysis a few years back when I painted “Jennifer in the Hunt” (a fox hunt featuring hounds in the foreground which I painted for the first time). I just feel so helpless when I face an unknown, unfamiliar subject. Nevertheless, one longhorn has been rendered, and I feel that I am ready to approach the remaining ones. This afternoon I spent more time working on that single longhorn, then turned my attention to the street, trying to render the textures and construction of the inlaid bricks. I also deepened the shadows in the trees and re-worked the brick column in the background. I feel that I am generating some momentum. I have a festival fast approaching–Discover Historic Mansfield Art Music Festival will be Saturday and Sunday. This will be my third straight weekend to participate in an art festival. So far, they have been worthwhile, and I hope the trend continues this weekend. This afternoon I replenished about fifty greeting cards that had been depleted during last weekend’s sales. Thanks for reading. It’s good to be painting again!